On the morning of February 23, Marines of Company E, 2nd Battalion, started the tortuous climb up the rough terrain to the top. 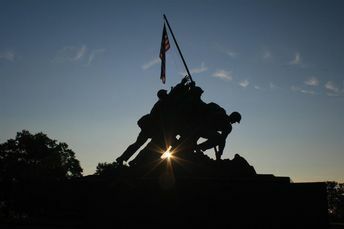 At about 10:30 a.m., men all over the island were thrilled by the sight of a small American flag flying from atop Mount Suribachi. This photo was taken sunrise. From this photo location the sun will need to rise at 108 degrees to peek through the legs of the marines.